Yesterday we were encouraged to spend some time reflecting on this painting of the Trinity. It is by the Russian artist Andrei Rublev and is dated to the 15th century. It is based on the story of Genesis 18 when Abraham is visited by 3 angelic strangers. This was interpreted by Rublev to be a visitation of the Trinity. It envisions the community of Father, Son and Holy Spirit to be one of peace, unity, mutual love and humility. Yesterday, as we reflected on the nature of God’s relationship within the Trinity, we were nudged to remember that in Christ, we are invited into that relationship with God. This is a little poem I wrote during that reflection. Think of it as God’s invitation to a life with Him around the table of relationship. What Does the World Need From Us Right Now? She didn’t want to be there. But there she was with her young teen son who was having blood sugar imbalance. They had traveled to Toronto on the way to see family. In the airport, her son’s blood sugar level went a little haywire. Before getting on her next flight, she asked a counter worker if there was some medical personnel on duty that could look at her son and make sure he should get on the plane. They immediately called paramedics who looked him over and took him away to the nearest emergency room. It wasn’t that he was really feeling that poorly, but they weren’t taking chances. So, there they were. Mom and son in an emergency room in another country, away from all family and friends. Not only that, but the emergency room seemed like an episode of the old show, ER. It was an overcrowded, frenzied atmosphere. People were rushing here and there. One man, clearly under the influence of some substance was walking back and forth, vomiting and moaning. There was the man who was yelling obscenities who was being watched over by 3 or 4 policemen. Staff was stressed, people were frustrated and angry. It was hardly a place for healing for this young teen and his Mom who were hoping to see their family. In an effort to keep their sanity, Mom suggested the two of them sing some songs they knew. He agreed. It started with some fun children’s songs they could quietly enjoy together. After a few, it their singing moved into some worship songs about God’s love, His grace and His goodness. They were quietly worshiping in the corner of that chaotic place. And then they realized something. The room was in a hush. Everyone seemed to be quietly straining to hear those two voices and experience whatever was happening in that impromptu worship service. The man quit his vomiting. The cursing one sat still and quiet. The staff was quietly going about their work of treating. As Mom looked around, she caught the eyes of a big security guard across the room, near the door. He gave half a grin, a wink and a nod of approval and appreciation. He knew what had happened. The place of pandemonium became a place of peace! In an effort to experience the peace they needed from the hand of God, they brought peace to a place that knew no peace. With all the chaos our country and world is in, those of us who know the peace of Christ, have something to offer. But we can’t give it, if we participate in the chaos. Our peace comes from centering ourselves in a life of worshiping the God who loves us. The peace we have is not just for us. We can’t give peace through demanding, arguing, or even convincing. Peace is experienced through people of peace. Where is your “unwanted emergency room of chaos”? Will you endure it? Or will you be a giver of God’s peace to people in turmoil? P.S. This is a true story, told to me by a friend about his wife and son’s personal experience. The facts were shared as I remembered them. My wife said, I need to get my “rant” out before I come home tonight. And sometimes, that’s what blogs are for… so here it goes. I think Fox News and Facebook have done more to hurt Christians this time of year than many other influencers. As a Fox News watcher, I think many Christians have mistakenly assumed that because they’re not “liberal,” they promote a more Christian worldview. And on Facebook, Christians promote and share statements that drive non-Christians away from the gospel. The biggest example of this, during the Christmas season, is the “war on Christmas.” There is a growing sentiment among many conservative Christians that our culture has changed. For good, or bad, it feels like Christians have less of a presence or voice. And that creates frustration, fear and anger. 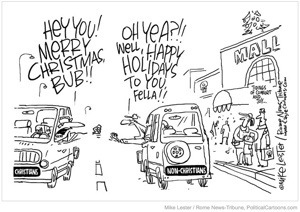 Hint: the Bible says there is no war on Christmas, it’s a war on Christ (read Ephesians 6:10-18) and it’s not new. People rightfully take our anger at culture as anger at them. We should be different. We need to be sprinkling “salt” and shedding “light,” not slashing and burning with sword-tongues and truth-bombs. 1. Put worship in your celebration. Be with other Christians and celebrate. Put aside personal celebrations for the sake of celebrating with the people of God. 2. Invite someone into your home who doesn’t have a place to be. Show them the love of Jesus. 3. Give, Give, Give. Give to your church that promotes the gospel message. Give to people in need, through your church or another helping organization. 4. Write a note to someone who is in prison, or in a care facility. 5. Speak peace to others. Adopt an attitude of humility and speak works of peace. Encourage people that forgiveness is possible by forgiving them. Heal wounds. Mend a relationship. Oh yeah, once we’ve done this for Christmas, we should put Christ into every day of our lives. When the world sees this, they are more apt to want the Christ in our Christmas. And then we all win! Let’s stop being told how to feel about the world around us. Jesus overcame his righteous judgment to offer grace and mercy. So should we. My frustration comes when others are telling Christians how to act and feel when it has no alignment with the Christ of the gospel. They are tapping into our base nature rather than challenging us to aspire to be more like Christ this Christmas. Okay… sorry for the rant! Now I can go home tonight. And I hope you have a new plan for sharing the Christ in Christmas. How will Christ be present in your Christmas? How will you share Him with someone else? I think our biggest struggle with thankfulness is not fought in the circumstances of life, but in the mind. So what are the things that we allow to happen which kill our gratitude? Killer #1 – Unrealistic Expectations. Have you ever thought life should be easier for you than for other people? Even if we love God, the world is the world. And we have to deal with the way it works. Every time we expect something from someone or from a situation that is unreasonable, it is just a matter of time until we are disappointed, frustrated or angry. Killer #2 – Forgetting the Intrinsic Goodness of God. One thing we have to let God convince us of and remind us of is His goodness. If we forget His goodness, we can go down the slippery slope of accusing God of not being good. Then we judge him and question his motives, rather than give thanks. The truth is, God is good. He cannot be otherwise and that is why Romans 8:28-29 are promises we can count on. Killer #3 – A Life with no White Space. White space is that part of the page, where there are no pictures or text printed. It includes the margins, the spacing between lines and even letters. Most of our lives are so jam-packed that we don’t have any space. Even the good things we do increase our stress and we never have time to consider, think, pray and meditate. We also don’t have time to enjoy the goodness we’ve been shown. This squeezes out gratitude. Killer #4 – Unholy, or Unhealthy Affections. When we are in love with the flesh, or the world, we distance ourselves from God’s desires. We strengthen these destructive affections when we entertain areas of sin in our lives. If we’re Christians, we live with the nagging sense of guilt. And guilt kills any chance of being thankful. Killer #5 – Self-Sufficiency. A growing sense of independence can distance us from the One who has given us all things. And we will stop seeing Him as the giver of every good and perfect gift. This kills any appreciation we should rightly have. So, what does real gratitude look like? 1. Contentment – When we are thankful for what God has done, we realize that He has done enough. Every desire is met with the fulfillment of His loving sacrifice and the life He has given us. 2. Joy – When we are thankful, we are filled with joy. Our lives become a picture of bounty. We are rich in Him. And as those who know Him, we have a source of lasting joy. 3. Patience – We learn to live with the pace of life. We take time. We let things work out their way. We let God take control because we know He has proven Himself faithful with everything we’ve trusted Him with already. 4. Openness – We become more open to others. We are free to trust. We are free to open our hearts and lives to those around us. We notice them. We pray for their needs. We long for God to bring the blessings we enjoy, into the lives of those we’re growing to love. 5. Giving – We no longer feel the need to hold, to have, to grab and possess. We become people who let go for the sake of others. We sacrifice and we’re okay with that. In fact, it truly becomes a source of greater thanks. 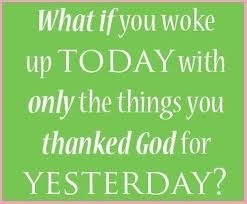 Do you think being thankful is important? Does it look like your thankful? If not, what thoughts have killed your thanks? What other things get in the way? This is a short presentation that I gave at a local mosque, during a community “Peace Symposium.” Would love to read any comments you may have. It is with joy and appreciation that I have come here today. Our hosts have shown me grace and acceptance and for that I am grateful. It is my hope that discussions like this will open the way to talk through our differences so we can be stronger in our faith and provide safety and security in our community. As a baptist minister of 24 years, I have a historical perspective on faith in this country that is part of my Baptist religious heritage. In the days of the colonies, Baptists were persecuted and expelled from certain areas, because of their different faith practices. There is a prevailing problem of mistrust in a society as religiously diverse as ours. The source of this lack of trust is three-fold. First, our religious differences become a wedge that drives us apart because we are influenced by misconceptions that we have picked up from a distance. We don’t take the time to listen and understand the other. We hear bits and pieces of others’ beliefs and many of those are distortions of what is truly believed. Secondly, the problem is that we act out of fear. We fear those who are different for many reasons. Sometimes, we are afraid of becoming the minority and loosing our place of power and influence. And sometimes, we are afraid of losing the cultural values and lifestyles that are part of our heritage. Thirdly, there are those of various religious traditions that have, from time to time, used their religious identity to control or subdue others. This has happened through physical force and political power. All of this works to create and maintain a chasm that makes living in a peaceful community difficult. Instead of opening ourselves to those who are different and learning to work together as citizens, we hide behind our doors continuing to enforce the distorted views and misunderstandings we hold. The answer to bridging the gap between people of distinctive religious beliefs is not to deny our differences. There is no solution in watering down our systems of belief to the lowest common denominator, which we call “faith.” Driving our unique doctrines and practices underground provides no lasting reconciliation or resolution. We must agree on another approach, whereby we can affirm the right of others to practice their faith and not be forced to affirm the validity or the veracity of their tenets or doctrines. First, peacefulness in society is most assured when we insist on the liberty of people, whichever faith they hold, to practice their faith in private and public. This right is based on a truly American tenet, that is, faith is an issue of personal conscience. We must believe wholeheartedly, that a coerced faith is no faith at all. We coerce others when we pass laws that promote or protect one faith over another. Through the political process we subtly communicate favor and thereby force others, through their citizenship, to materially support a religion to which they don’t adhere. We also coerce others when we insist, with public pressure, that people dilute their religious distinctives and deny the doctrines to which they adhere. As a believer in the Lord Jesus Christ, I am convinced that personal salvation is only through the atoning death of Jesus Christ and the power of His resurrection. It is common to feel uncomfortable proclaiming this doctrine of exclusivity, because there is a growing movement that says, to declare such a thing creates division. Our unity as citizens won’t come from denying someone’s right to make such statements. But our unity as citizens will become most evident when we all insist on that right. Second, each of us must be secure in the tenets of our own faith. When we are secure in what we believe, we will not need to be afraid of the faith of others. Fear makes us react to our differences negatively and unproductively. Security and confidence moves us to listen, understand and interpret for ourselves the truth of the others’ claims. I encourage you to know your faith. And learn about the faith of those around you. Third, each of us and our religious communities must strive to not needlessly offend the other. There are times when we can insist on our rights and be legally correct, but we may make a community spirit more difficult to achieve for our society as a whole. In those times, we must assess, with love and compassion, the necessity of our action. If there is a solution which does not deny the convictions of our faith, we should consider adjusting our actions. In other words, we must strive for the high road, which continually makes room for the other. Fourth, where we share certain values, we can and should work together in civil or secular causes. There are times, when we must join hands, not as members of a faith community, but as citizens of our common community, both religious and secular, to create a safe and secure society. Because when a community is safe and secure, people will experience a freedom to exercise their faith from a footing of confidence and joy. I look forward to striving together in the Glen Ellyn community, to affirm the right of religious liberty for all. And as we unite on that core conviction, we will each be assured the ability to worship God the way our conscience dictates. And in that, keep this foundational right that acknowledges God’s right to rule and reign in the lives of men and women, and our right and duty to serve Him.